Ever wonder why I get into so much trouble or have so many shenanigans? By heart, I’m a scientist. At a relatively young age, I decided to be a meteorologist. Even at the University of Washington, when I had the opportunity to meet a lot of kids like me studying to be engineers of some type, I still eschewed engineering, believing meteorology was more “scientific”. Only some years later, working on a forecast through the night, I realized that in practice, a synoptic meteorologist, is a weather engineer. As we take the science of the atmosphere and put it to a practical use. Oh, for the hubris of youth. Sometimes I do miss the certainty that comes with inexperience and knowing everything. In a world for me that was once black and white, there are now only shades of gray. Even that, though a better place, and heaven knows the world could use for less absolute people, does have some drawbacks, which I may expound upon at another time. Anyway, back to the story. 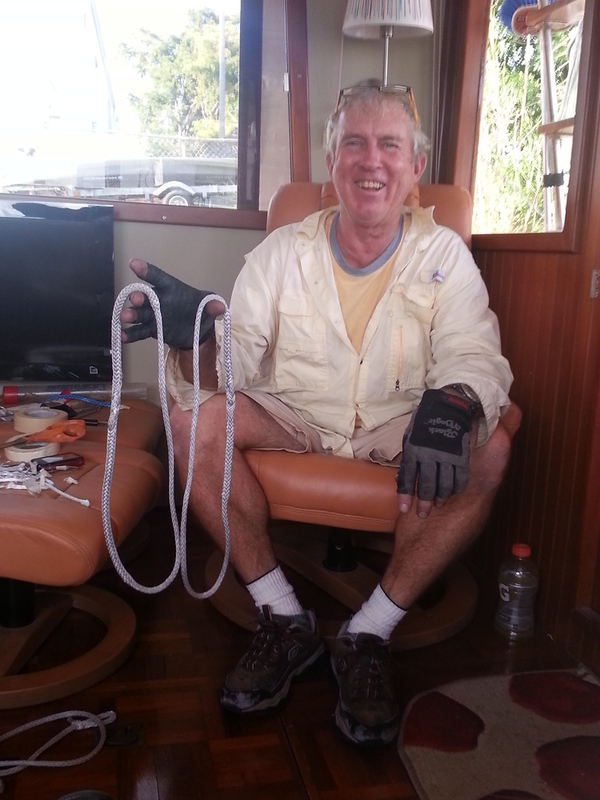 As I hauled up my new Delta 55# anchor, which worked like a dream, made even better because Hopkins Carter has the most competitive prices, and even less expensive than even Jamestown, with no stink’in shipping. I decided to deploy the poles, but leave the fish on the rail. That way, I would not have to go to the fly bridge to deploy them while underway and I needed to adjust the port side aft and fore guys, as port side pole was running about 6 inches too far aft for my liking. That done, power on, look around to make sure nothing is in front of me and I see that one of the fish already fell into the water, but the other is obediently waiting as directed. So the experimenter in me takes over. To retrieve the fish, I would have to go up to the fly bridge and retrieve the pole to vertical, go down and pull in the fish. Forget that. I decided to see what would happen with one fish in the water. Power on, Dauntless, like a Top Fuel Dragster, gets to 5 knots in about 20 seconds. As I am moving north, turning towards the east to go out of the inlet (see picture), I decided to stay on the south side of the inlet, as there are bunches of sport fishers, dive boats, skiffs and all sorts of south Florida water life, including a few jet skiers, coming from Palm Beach to the north also turning into the inlet to exit into the ocean. After carefully measuring the additional rudder, 5°, I need to keep the boat straight with only one fish in the water, I look to my left and see this multitude of boaters racing out of the inlet at Warp 10. F.. this, I throw the other fish in the water, and should a jet skier run into it and get decapitated, let heaven sort out who was right and who was wrong. Going back to the helm, I confirm the 5° deflection is gone and I see the humongous wake rolling up on me, maybe 4 to 5 feet high. I watch in fascination as it hits the port side of Dauntless and just like that disappears, just like that, they were gone, like Keyser Soze. My side decks are dry while underway. Another first. Even with that wake, it took just a cup full of water thru the port scupper. Normally my side decks, well not mine, Dauntless’are continually bathed in sea water. So I knew we needed them. In searching for a boat, when we came back to the Krogen 42 idea, I realized that while we needed FS, they could be added after and that the boat layout (two heads) was more critical, as well as the overall condition (I knew I could not deal with a project boat, one that always needs something fixed or replaced). Julie and I loved Pay to Play, when we first saw her and we ended up buying her a year and a half later. Having run aground three times in the first month, while I did expect that frequency to decrease, I knew it wasn’t going to zero in this lifetime. So, it just also confirmed that I needed paravanes. Fish (aka paravanes) in the water, this gets reduced to a few degrees each direction, with the bad ones to about 10° ! Overall roll is reduced by at least 75%. The fact that I was hit with a 4 to 5 ft. wake this morning, and we didn’t roll at all, says it all.